If you've been looking for a band that picked up where ? and the Mysterians left off then you should have been at Memories on Monday night. Fellow Michiganders Wett Nurse have taken the organ-infused garage rock of said band, added a bit of West Coast psych-pop, and crafted a sound that's as haunting as it is addicting. Their guitarist plays his instrument like it was a shotgun, riding waves created by a combination of urgent percussion and a creepy crawler organ sound that gives the whole set a sort of Scooby Doo-on-acid feel. Playing tracks mostly culled from their debut album, Worships the Devil, the trio's live sound belies their age. Not once during the show did a song collapse under its weight. Each one simply created its own fuzzy cloud, knowing exactly when to drift away. The straight-forward rocker "SPOOK IT" felt tight and seemed to bow out right on cue, while other numbers, though equal in length, seemed a bit more sprawling. 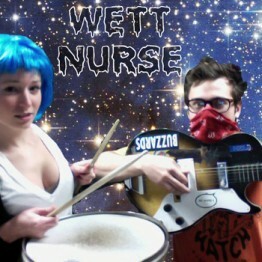 During the finale Wett Nurse appeared to melt onstage, warbling to the end like a delicious microwaved Peep. The Lopez, a noisy, Buzzcocksian two-piece from Philadelphia, were up next. Vocally, lead singer Stephanie Flati has a Belinda Carlisle thing going on, which meshes perfectly with her husband Jesse Lopez' chainsaw guitar. Some of the fuzzier tunes recalled The Thermals, though they tended to be closer to fun romps than desperate assaults. Then only thing that hurt the band onstage was the lack of a proper drummer. Though not a hindrance on The Lopez' EP, I can't help but think that the drum machine left a bit of a hole in their performance. That said, the duo certainly rocked as if they had a full band up there, leading me to hope they stroll back through town with a third member soon. They really hit their stride towards the end of the set with "Funny Hat Club," a song that just about transported the crowd to a garage where Flati's snotty wail was fitly complimented by cowbell donks and solid guitar riffs. By the time they wound down I wished I had a driver's license. The Lopez are perfect for the soundtrack of a coming of age story, specifically one that ends with a make-out scene and a getaway car. What a great post, thanks a lot for the decent show review.